Sweden's pack of Heavy Metal stalwarts, WOLF return with their seventh studio album entitled simply, Devil Seed. This time around, the wolves have teamed up with Jens Bogren (KREATOR, PARADISE LOST, OPETH) over at Fascination Street Studios and have delivered not only a heavy sounding release but also one chock full of clarity and complexity. With cover artwork being created once again by legendary designer Thomas Holm (MERCYFUL FATE, KING DIAMOND), all the elements are aligned for this fierce slab of pure Heavy Metal mayhem. 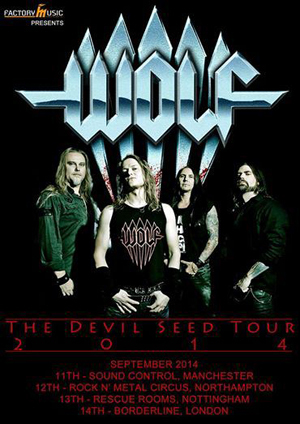 WOLF has been one of the leading bands within the classic Heavy Metal scene since their inception in 1995, and with releases such as Black Wings (2002) and Evil Star (2004), WOLF has helped paved the way for a new generation of bands whom are influenced by the sounds of the legendary Metal bands of the past. Fans will be pleased to hear that WOLF is not only still true to their musical ideal, but deliver a fresh and unique take on the sound that is their unmistakable trademark. "I haven't been this pleased with the songs on a WOLF album since the release of Black Wings, which scored 10/10 in Rock Hard magazine", says founding member Niklas Stalvind. "I really think we have taking our songwriting to the next level on this one and I hope that the metal fans will love it as much as we do". The first album teaser will be released in May, so keep your eyes peeled, once WOLF gives you a taste of Devil Seed, it might very well grow into an uncontrollable beast.